For centuries, Chinese poets, painters and artistic people with a deep sense for the aesthetic have used Guilin as a yardstick for natural beauty. The throng of limestone peaks that rise abruptly from the plain—often shrouded in mist—is what makes Guilin’s scenery so special. Amidst the peaks winds the Li river, a tributary of the Pearl river, green and placid, dotted with bamboo rafts and straw-hatted men fishing with cormorants. The karst peaks are the result of sea-bed movements 100 million years ago which settled huge deposits of calcium carbonate, namely limestone, on the earth’s surface. Water and wind eroded these deposits into their current fantastic shapes. 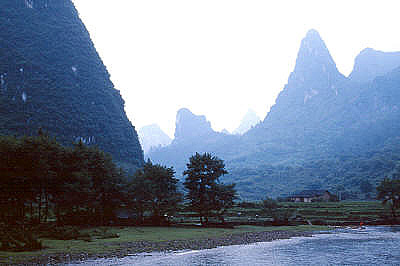 Guilin, the capital of Guangxi province, has a population of 4 million. Guangxi is one of China’s five autonomous regions along with Tibet and Mongolia. Autonomous regions have a different set of rules and policies applied to their governance. They are first and foremost controlled by the indigenous people themselves. Additionally, the nation-wide one baby policy is replaced with two children per minority family here. Minority people pay lower fees at the universities and receive allowances from the government for education and health care. The Zhuang nationality, renowned for their folk songs, are the most populous in Guangxi. In the whole of China there are only one million of them. Other nationalities in the province include the Yao, famed for the long hair of their women [their hair is cut only once in their lives at age 18], the Miao with their beautiful costumes, the Dong, and the Dai. The Li river cruise is one of China’s most popular trips, taking one past a panorama of karst peaks, sleepy villages, and bamboo groves. It is also the most picturesque way to reach fabled Yangshuo to the south of Guilin. The cruise takes between five and six hours, taking one slowly down the 83 kilometres stretch, past rock formations fancifully christened by painters and poets. Yangshuo is a legendary corner of China; a pastoral patchwork of fields, rivers and limestone outcrops that are the most beautiful cluster of peaks in the whole country. We were served snake wine on board. A glass jar filled with wine and a coiled snake within its depths, hissing and twirling. Forget wine, I didn’t even bother to eat lunch. I was replete with nature’s beauty. Yangshuo’s bazaar is like an Aladdin’s cave. Packed with the most exquisite items at the most ridiculously low prices. Pure silk brocade cushion covers for just 10 Yuan each. Bags, scarves, fans, lace, umbrellas, jewellery … the list endless. The black night saw me watching cormorant fishing in Guilin, the traditional way of fishing in China, with a tour that accompanied the local fishermen. The sleek birds are deft at catching prey, lured to the surface by bright lamps. The whole fishing process can take up to six hours. With a life-span of 20 years, the cormorants are most efficient at the age of 15. Their eyesight fades thereafter, but are kept on by the families as pets. The Li river flows right through Guilin and past its two lakes, the Banyan Lake and Fir Lake, which lie next to each other in the centre of town. The river makes for a fascinating sight in the early morning, its banks dotted with Tai ch’i enthusiasts and ballroom dancers. I spent my second day in Guilin doing all I was “supposed” to do in Guilin. I hiked up Folded Brocade Hill in the blistering hot and humid sun, cooled momentarily by the refreshing Wind Cave decorated with calligraphy and Buddhist statuary that I crossed on my ascent. 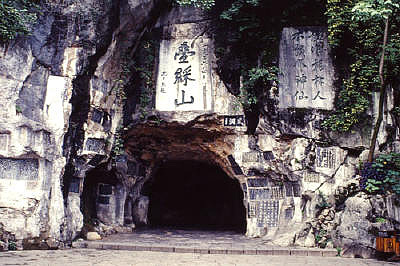 There are two caves at the site allowing for the wind to funnel between them in a fresh breeze. Four Views Hill, my next stop’s, chief claim to posterity is the museum at its base housing a magnificent, albeit callous, collection of colourful mounted butterflies and a bird park with handsome peacocks. The Reed Flute Cave, halfway up a hill and at a height of 500 meters, has some of the most arresting scenery in Guilin with its cavernous labyrinth of stalactites and stalagmites illuminated by brightly coloured lights. Water drips cover the rocks in a cold sheen. It is a spectacular product of nature, especially the vast Crystal Palace of the Dragon King, a huge hanger of a cave, partially suspended over a frigid lake. 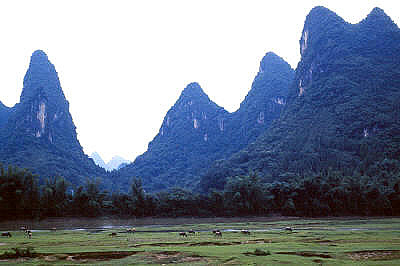 Other “official” attractions include the geological oddity of Elephant Trunk Hill with its trunk in the Li river, nearly 200 stone carvings on its surface and a pagoda on the top, and the Seven Star Park, a well-tended public garden studded with seven peaks thought to resemble the great bear constellation. I visited a tea garden in the afternoon wearing a cute straw local hat and then went into a tea estate to learn about the long gruelling task of making Chinese tea and drinking it, and the rigid rules that encase the tradition. Only one-third of the pot is to be filled. The temperature of the water is to be between 85 and 90 degrees Celsius. The cover lid of the tea pot must not be covered completely. And the tea left to brew for exactly 12 seconds only. Unfermented tea is to be drunk from porcelain tea pots. Semi-fermented tea from clay teapots. There is even a technically correct way of holding the cup. The colour of the tea is based on which part of the plant is used. New leaves and the top of grown leaves are used for green unfermented tea. Black tea, fermented, is the bottom portion of the leaf. The leaves are twisted, rolled and then baked to remove their natural moisture. There are many different species of tea leaves as well. A popular one in the Guilin area is the Oolong, semi-fermented and known for its slimming effects. Reflexology has been practised in China for thousands of years. Clinical practice has proven that general diseases of the body can be cured by therapy applied to the foot. Every organ in the human body has its reflexological area on the bottom of the feet. This area reflects pathological changes in the body and can, therefore, be used to make diagnoses of diseases. At the same time, various types of stimulations applied to specific reflecting areas on the foot can improve and preserve health, and prevent and treat diseases. Later in the night, I took the four lake and two river night cruise. It was absolutely beautiful; a magical world of blue-green lights with fairytale bridges, musical fountains, waterfalls, dazzling pagodas, a small dam and single loch. The Fir Tree lake is adorned with two pagodas, the silver-roofed moon pagoda and the copper-roofed sun pagoda which also happens to be the largest pagoda on a lake in China. The Wooden Dragon lake is embellished with recreated pagodas and buildings in Song dynasty style. I repeat myself, it really was beautiful. China continuously surprises me. I had reached Guilin, expecting a small town nestled in nature. I discovered a vast elegant city with majestic landscapes for company. My next stop was Sichuan province and the Buddhist circuit of Mt. Emei and Leshan. I had often read that China was deeply religious. This is, however, more true with regard to the older generation. The younger crop, nurtured in Mao’s era, are generally atheist, laying far more importance on Confucianist principles on the correct way to live, rather than being bound by any spiritual dogma. The Chinese Communist Party has tried to replace religion with devotion to Marxist-Leninism, with varying successes. Chairman Mao attempted to purge China of superstition with the Cultural Revolution (1966-1976), but instead turned himself into a demi-god who is still idolised and worshipped in shrines around China. The Communist party till today reacts with concern to any creed that offers an alternative vision to that bequeathed by Karl Marx. This entry was posted in China, Exploring our World and tagged China Five Autonomous Regions, Chinese Minority Nationalities, Li River Cruise, Things to do in China, Things to see in Guilin by Rama Arya. Bookmark the permalink.